Domino’s new series may have just started, but due to popular demand (according to a Marvel press release), Marvel is giving fans even more with an Annual this September. And they’re pulling out all the stops. Gail Simone, Fabian Nicieza, Dennis Hopeless, and Leah Williams are all writing for the series, along with artists Victor Ibanez, Juan Gedeon, Natacha Bustos, Leonard Kirk, and More (who we presume to be a Franco-Belgian comic artist — it’s pronounced More-ay). 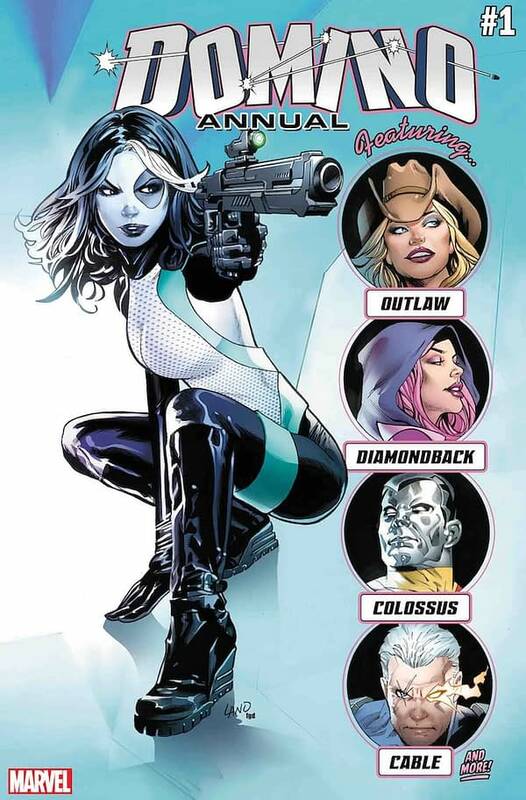 As if that weren’t enough star power, the series will see guest stars, not limited to Domino’s usual gal-pals Diamondback and Outlaw, but also Cable, Colossus, and “More” again. Plus, Dennis Hopeless will kill off a beloved teen character! Okay, it doesn’t actually say that, but it will probably happen. Everyone’s been asking where this partnership between Domino, Diamondback, and Outlaw began. But there’s so much to cover in the present with Domino’s newest antagonists that we couldn’t take a pause from the action. When the opportunity arose to break that story in Domino Annual #1, the team jumped at it! Domino Annual #1 hits stores on September 26th, competing with Valiant’s Harbinger Wars Aftermath #1 and DC’s Heroes in Crisis #1. Given the choices, we’d definitely go with Domino, which has been a very entertaining series so far.